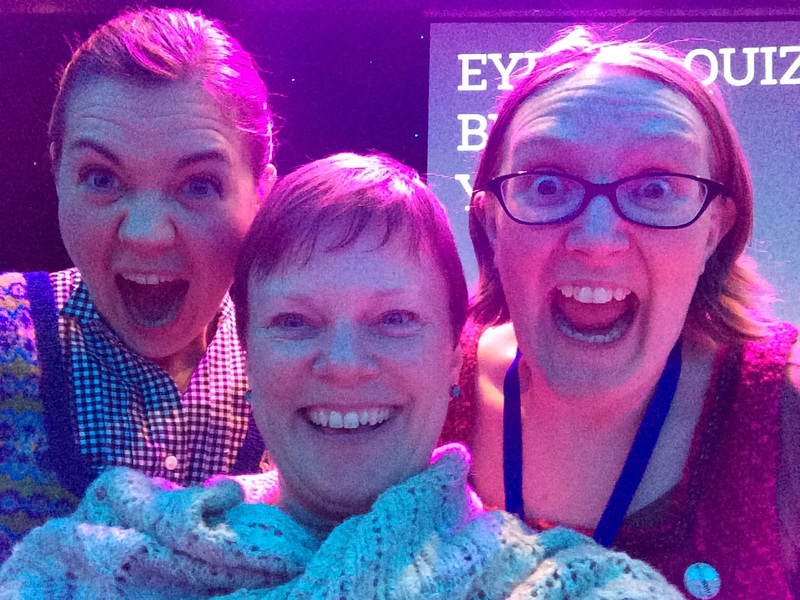 It’s only me, Melanie, come to tell you about the fabulous time Bee and I had at Edinburgh Yarn Festival last weekend. First of all I have to tell you that the excitement levels in anticipation of this event were sky high. It was all I could think of. I did planning even! Yup, I went through the vendor list with a fine tooth comb. 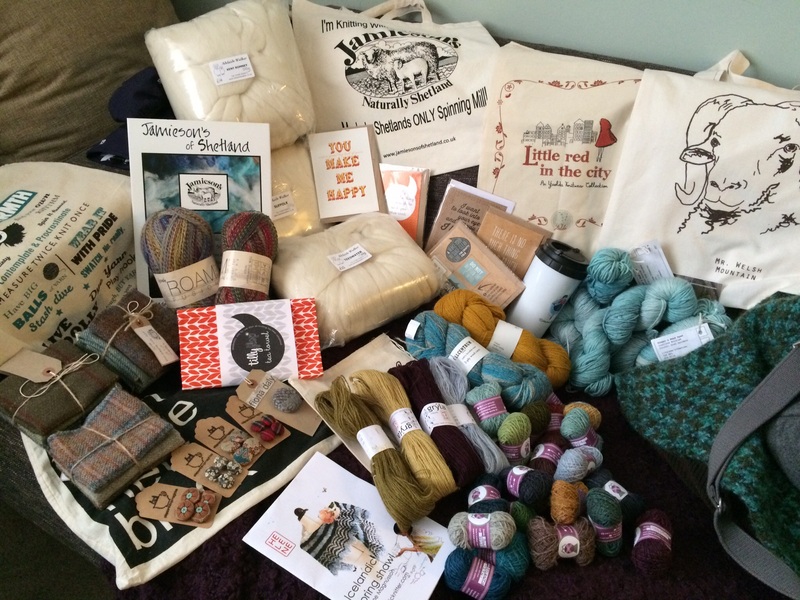 I went through my Ravelry queue, favourites and library looking for gaps in my stash, the whole shebang. I was, I think, quite restrained in my purchases although Bee thinks I am overly susceptible to yarn fumes but believe me I could have bought WAY MORE had I the funds. Anyhoo, so this is how it went. I arrived on a very wet Thursday evening and managed to meet up with Bee for dinner despite the taxi driver dropping me off on the wrong road. My slight Aussie twang that everyone here seems to think so pronounced that some people are surprised I’m actually English must have confused him so much that he couldn’t tell the difference between road and street. But I digress, dinner was lovely, Italian for those who like to know these things and then on to Bee’s place as she very kindly put me up. The next morning she took me on a tour of Edinburgh. 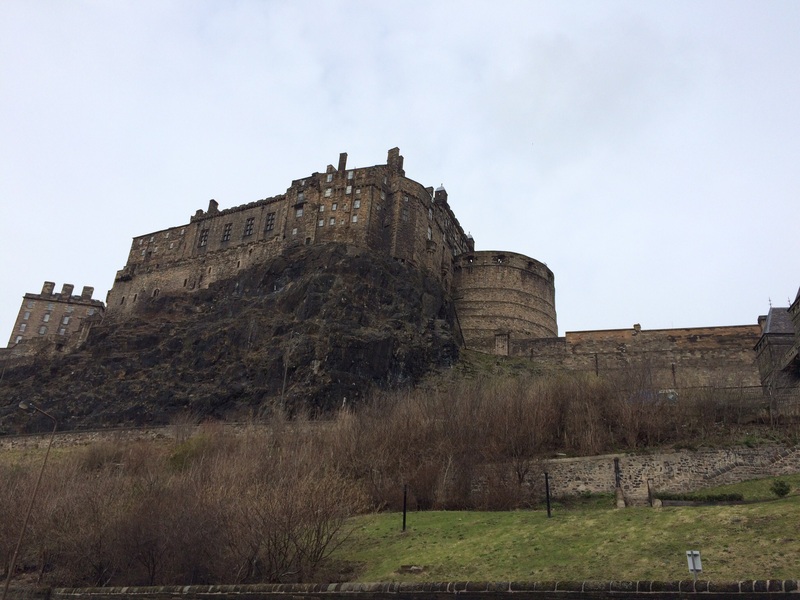 We visited lots of great foodie places of which Edinburgh has many. 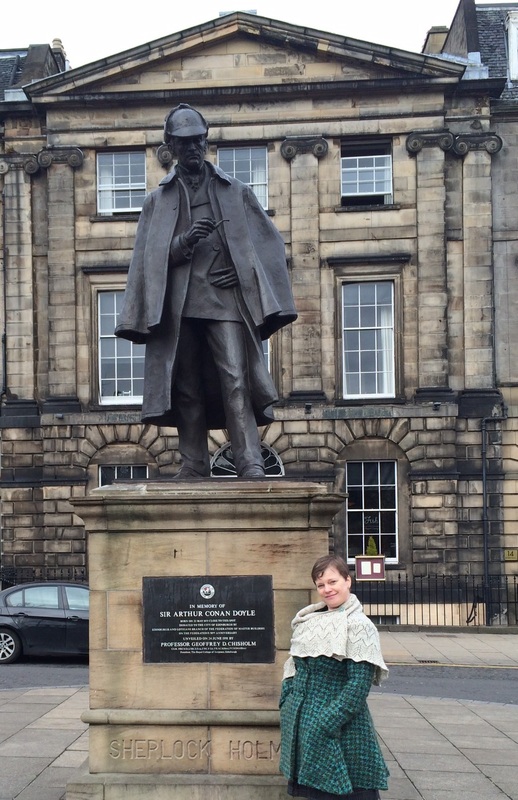 On our way to the Royal Mile we passed the statue of Sherlock Holmes. To my great shame I never knew that Sir Arthur Conan Doyle was from Edinburgh. We walked part of the Royal Mile stopping at various shops of interest along the way. I have to say that Edinburgh from what I saw of it is one of the most beautiful cities I’ve ever been to and I barely scratched the surface. The final destination of our walk was Edinburgh Castle although, we decided not to go inside as I really want a full day to explore it properly, plus, it was lunchtime. 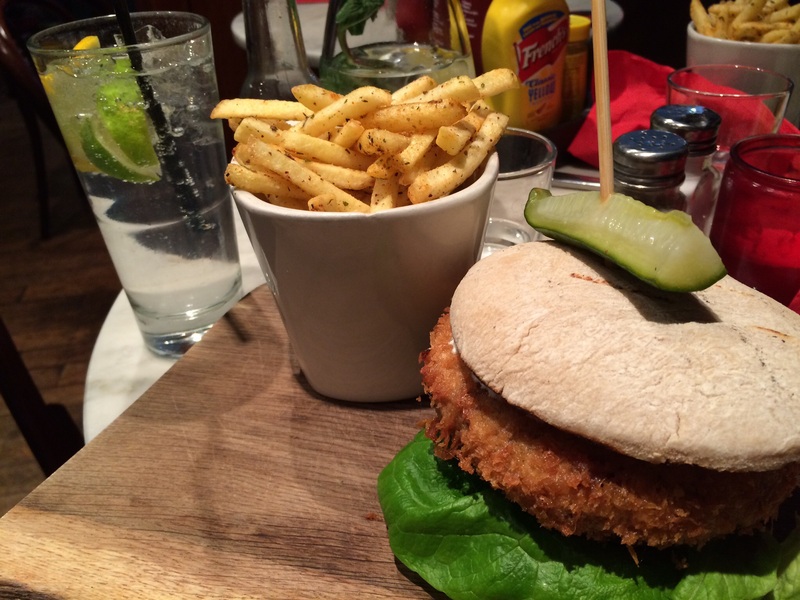 Lunch for me was a veggie haggis burger and fries washed down with Edinburgh gin. Yum! Saturday was our day at the marketplace of the festival. 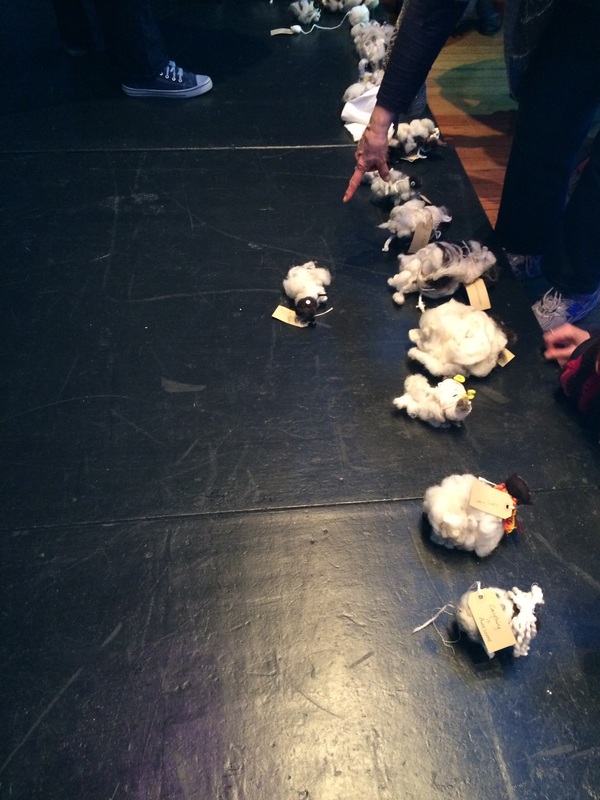 Once we were in we made a bee-line for the lovely Jules of Woollenflower who recently moved to Glasgow from Melbourne. Jules was there as a vendor selling her beautiful colourwork cowls and Harris Tweed knitting tool pouches. 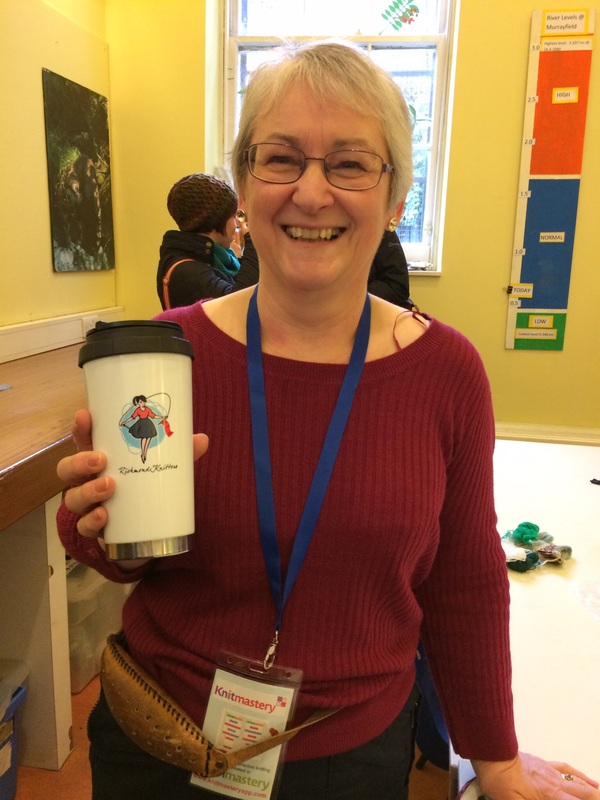 Her stall was a great success and much admired by the knitterati and us mere mortals alike. We then did a circuit of the stalls purchasing along the way. I wish I had the time to tell you about all of the beautiful woolliness on offer, seriously amazing! I found a lot of yarns and yarnies and other wool related artists that I’d not heard of and will be purchasing from in the future. For now though, here’s what I bought. The day ended with a Cabaret Show with a hilarious presentation by Felix of Knitsonik and pub quiz by Felix and Ysolda. 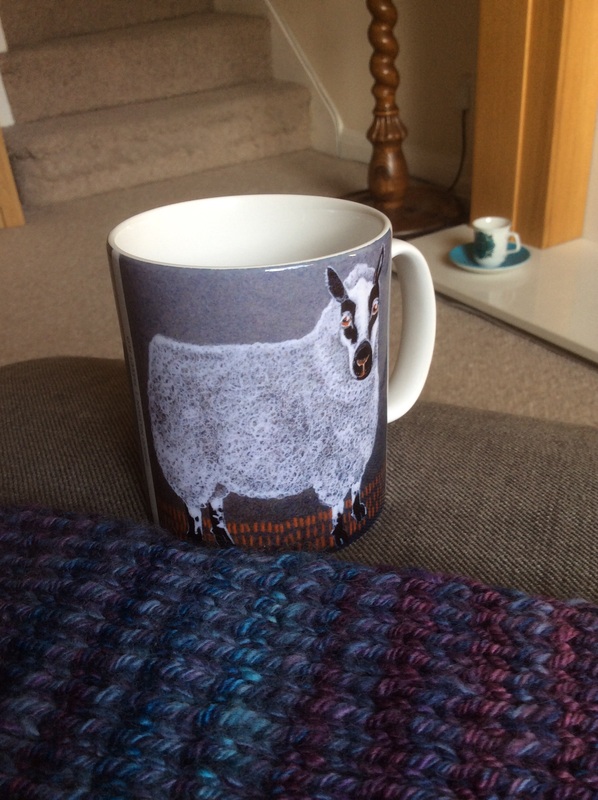 Our table came second in the quiz and we won the make a sheep contest on the night winning us beautiful sheep mugs by one of the artists exhibiting at the show, Ingris Nillson. I did much yarny fangirling too. The next day Bee and I were enrolled on a class by Hazel Tindall on Fairisle knitting. I’ve never attempted any colourwork and was a little daunted but Hazel was a wonderful teacher, very patient and generous with her knowledge. We loved that the little cuff was already cast on and knit to one row past the rib section agreeing that if we ever win the lottery we’ll have a personal assistant to cast on all our projects. 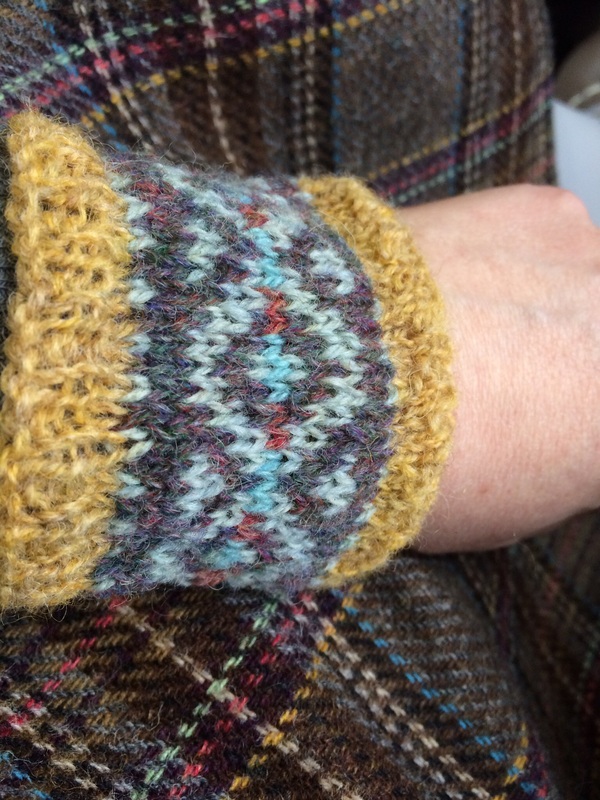 I have to say I really enjoyed knitting the cuff and I’m finally going to be knitting the Endpaper Mitts that I’ve had in my favourites since I joined Ravelry all those years back. Here’s one of my finished cuff, the colour choices will be a shock to all who know me IRL. In fact Hazel commented on how they were almost identical to the colours of my skirt. Predictable, moi? 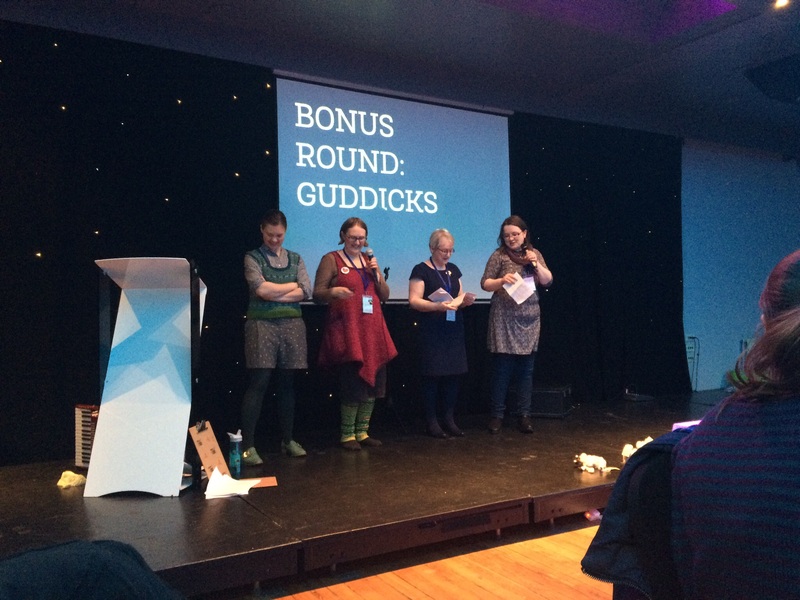 So to recap, Edinburgh Yarn Fest was utterly, utterly, utterly brilliant and I can’t wait for the next one. Feel free to join us. Gosh, what a blast you guys had! Wow how awesome! 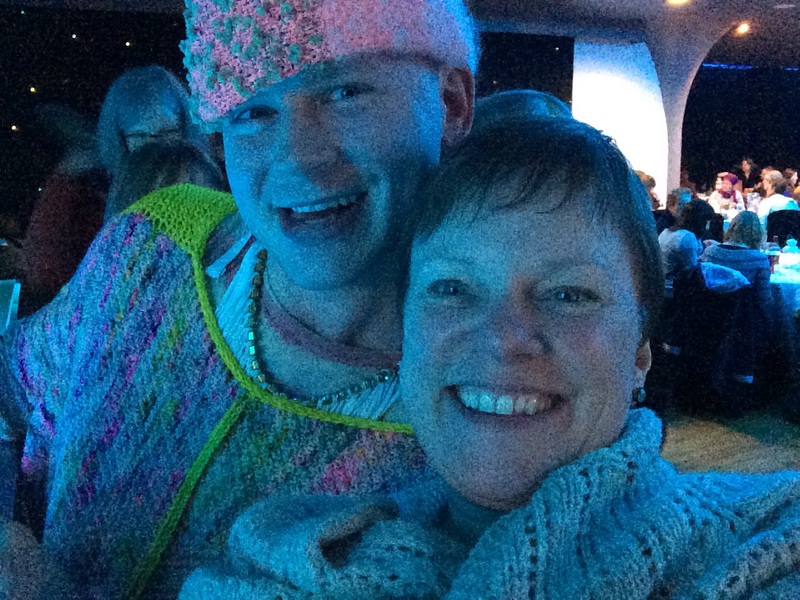 Great blog post and photos, I would love to do the Edinburgh fest with you one day.